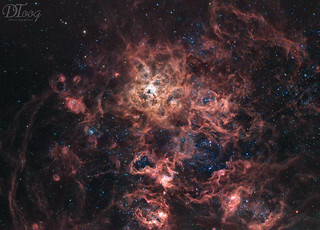 Tarantula Nebula is an impressive cosmic object, it lies in Great Magellanic Cloud, a nearby galaxy of our local group. This nebula is very rich in hydrogen, in this image we can see many complex clouds of ionized gas. NGC 2070 is a jewel for southern astrophotographers and I'm feeling so happy with this work. It's always a challenge to get this nebula because it is high on sky in rainy season here in Brazil. Besides that, it was a great pleasure to do this work because there was a cooperation between Rick Stevenson and me sharing our h-alpha images to improve exposure time.